Heterotaxy: "heteros" means different, "taxis" means arrangement (from the Greek). Isomerism: "isos" means equal, "meros" means part (from the Greek). Isomerism refers to the similarity of bilateral structures that are normally dissimilar. atrial appendages exhibiting right morphologic features. partial anomalous pulmonary venous connection. and a morphologic left atrium connects to a morphologic right ventricle. and a morphologic left ventricle gives rise to the pulmonary trunk. Double discordance: Atrioventricular discordance together with ventriculoarterial discordance. The result is physiologically correct circulatory flow. Heterotaxy syndrome affects up to 1 in 10,000 live births and is associated with high mortality rates. There may be levocardia, dextrocardia, or mesocardia (midline or indeterminate apical orientation). Left isomerism is usually associated with polysplenia. Right isomerism is usually associated with asplenia (Ivermark syndrome). the gastric bubble, liver, and spleen. a symmetrical branching pattern being suggests atrial isomerism. Discordance of the cardiac apex and abdominal viscera is often suggestive of heterotaxy. and total anomalous pulmonary venous drainage into a systemic vein is seen in > 50% of cases. Right atrial isomerism is usually associated with severe cyanotic heart disease in infancy. The syndrome is associated with a poor prognosis and high mortality rate (80%-90%) in the first year of life. The sinus node is usually present bilaterally in right isomerism. by a sling of tissue. The P-wave axis is generally normal because the right sinus node is usually the dominant atrial pacemaker. Supraventricular tachycardia is attributed to reentry between paired atrioventricular nodes. In left isomerism there is often polysplenia. return, and up to 50% of cases are associated with dextrocardia. and the infrarenal segment continues as the azygos or hemiazygous vein. The sinus node is usually absent bilaterally in left isomerism. Fetal complete heart block is presumptive evidence of in utero left isomerism. left atrial isomerism is the most common cause. and a morphologic right atrium. so the sinus node is absent or hypoplastic. The atrial pacemaker is therefore ectopic, and the P-wave axis is abnormal. it may fire slowly (ectopic atrial bradycardia). More than half of the patients have a left atrial rhythm. 1 of 20,000 newborns. Left atrial isomerism is the most commonly associated structural cardiac defect. 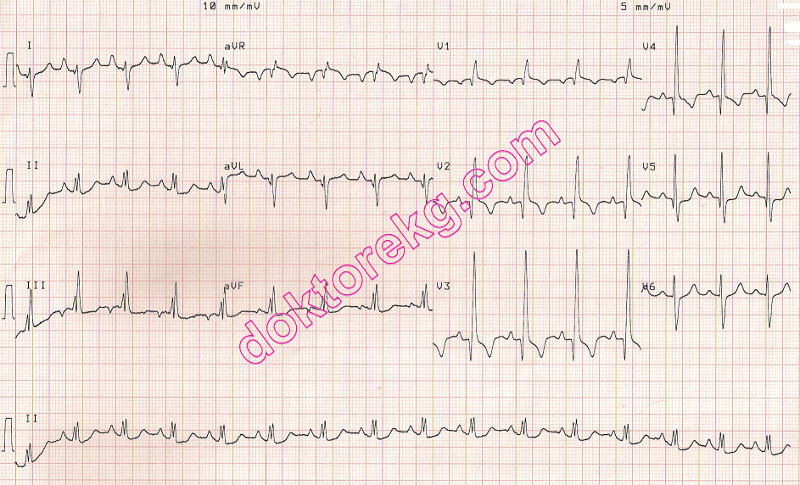 Atrial fibrillation and atrial flutter may be seen occasionally. a configuration associated with a left atrial ectopic focus irrespective of atrial situs. 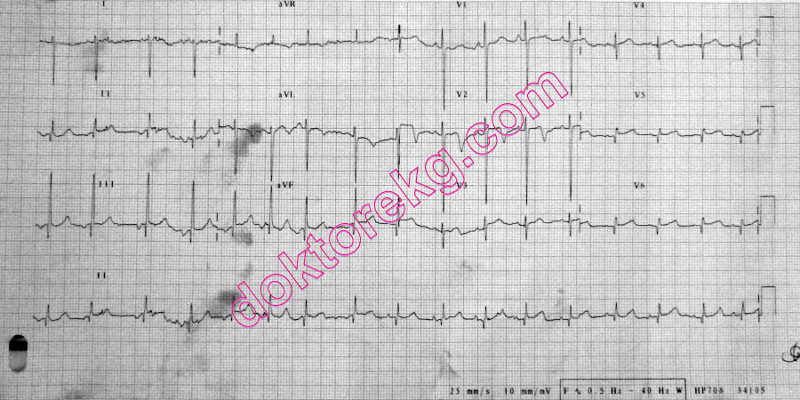 J Am Coll Cardiol 1998;32:773-779. Am J Cardiol 1987;59:1156 -1158. J Am Coll Cardiol 1998;31:1120-1126. J Am Coll Cardiol 1992;20:904-910. J Am Coll Cardiol 2000;36:908-916. Journal of Cardiovascular Computed Tomography 2012;6:127-136. Pediatric cardiologist Dr. Mahmut Gokdemir has donated the above ECG to our website. ECG 1b. The above ECG tracing is from the Holter recording of the same patient. P waves with multiple different shapes show wandering atrial pacemaker. ECG 1c. The above ECG tracing is from the Holter recording of the same patient. ECG 1d. The above ECG tracing is from the Holter recording of the same patient. ECG 1e. The ECG above belongs to the same patient. It was recorded 1 year after ECG 1a. The P waves have different shapes in this ECG. The ectopic atrial pacemaker can shift from one site to another in atrial isomerism. ECG 2. 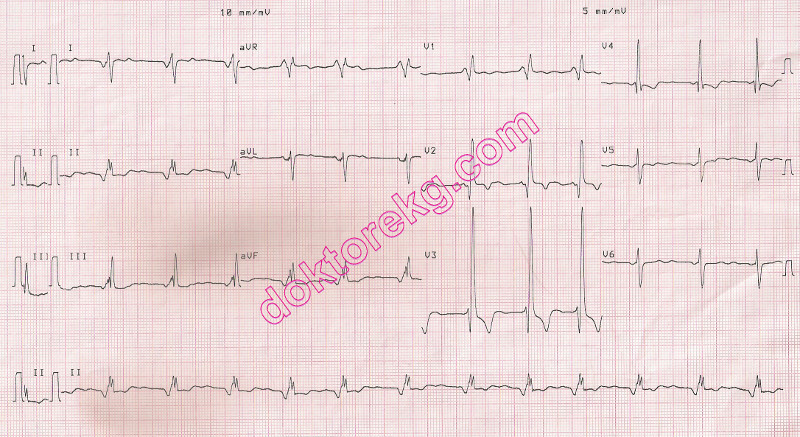 The above ECG is from an 8 months-old infant with left atrial isomerism and complete AV canal defect. P wave axis in lead II is variable. Pediatric cardiologist Dr Ahmad Usaid Qureshi has donated the above ECG to our website.